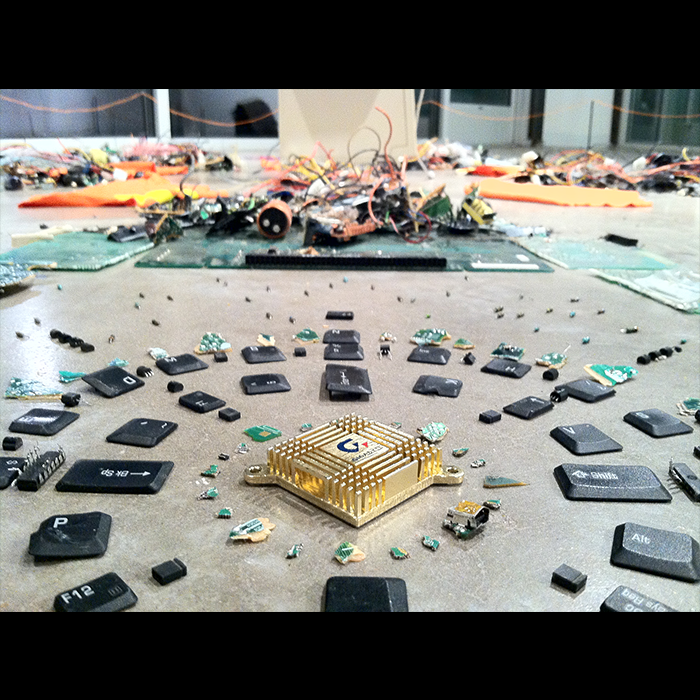 In this series, I disassemble electronics as a public performance, then reassemble the components into intricate mandalas. 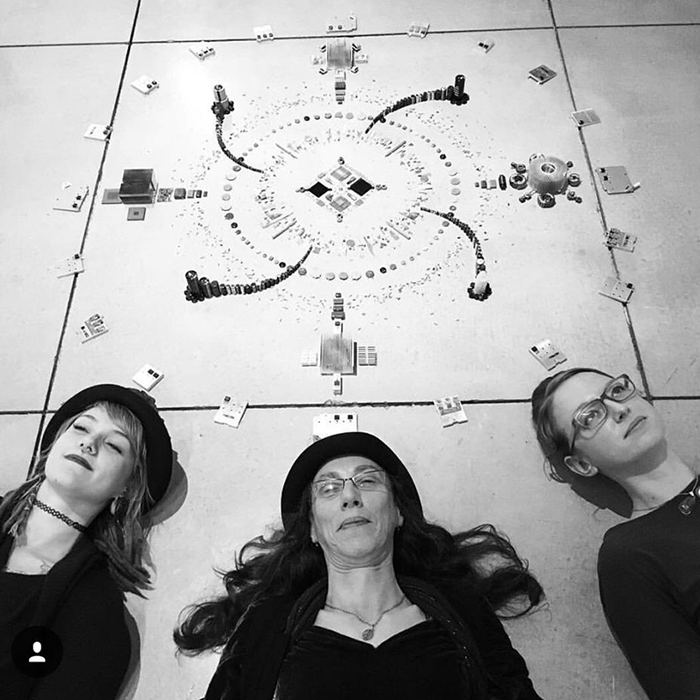 These projects have been done as solo and group performances, or in student workshops. Perhaps one of the Americas darkest secrets is that much of our e-waste (including home appliances, tv’s, computers, cell phones, etc.) ends up in landfills, and of the portion that is recylced, 80% is illegally shipped to other nations (mainly China, Africa, and India) to be disassembled under extremely hazardous conditions. The technological revolution has reached every corner of the globe, precipitating the most rapid changes to the world’s economies, cultures, and ecosystems that humankind has ever witnessed. My goal with taking this project into classrooms is to offer students a wider perspective on the electronic devices that have become so integral to our lives. First, I give each student an electronic device (cell phone, keyboard, etc..), plus safety gear and tools to completely disassemble the device. Next, I offer a talk on electronic engineering including: what all the components do, what materials they are made of, and safety concerns. Then I discuss the entire life cycle of electronics, from mining and manufacturing, to marketing and consumption, to waste and pollution. 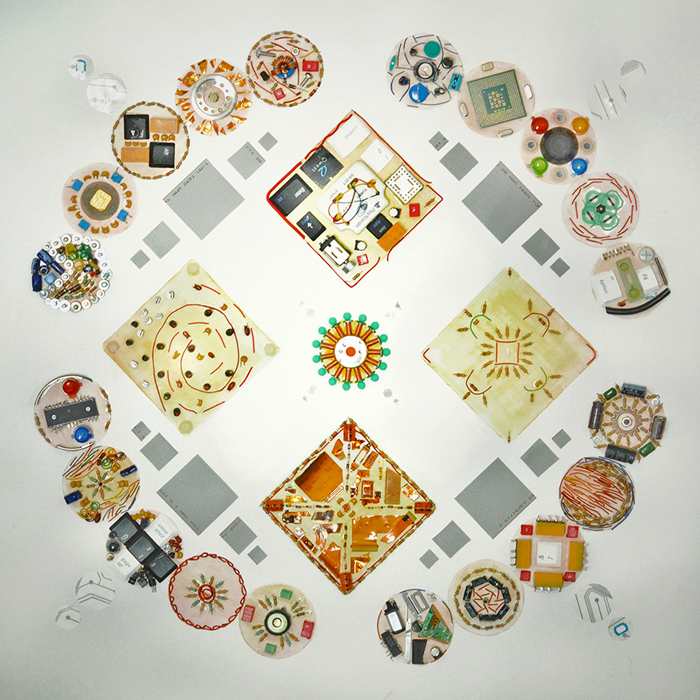 After disassembling, I lead the students in making tiny mandalas from the wide variety of colorful components. 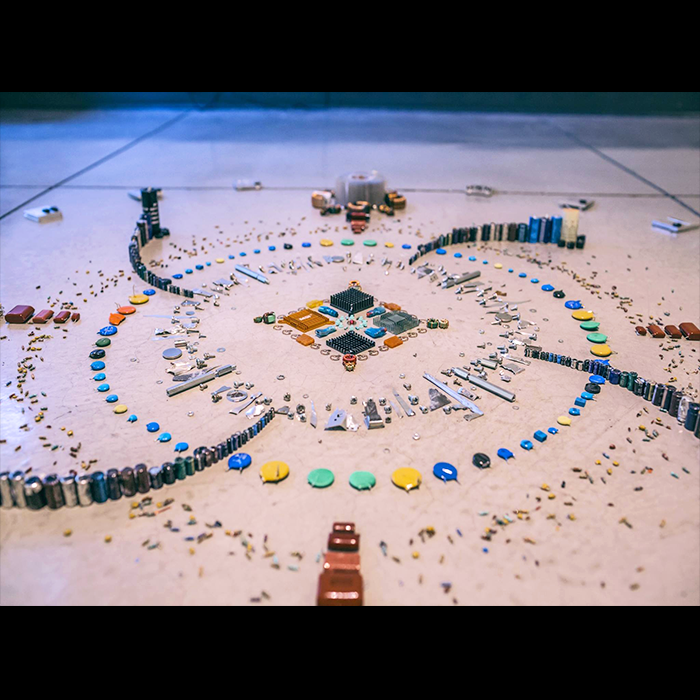 Depicted below is a class project I led with Seabury Middle School where each student’s mini-mandala has been combined to make one large artwork. This final design shows the student’s thought and understanding towards not only design and composition, but also towards the materials themselves: what they are, where they come from, and why they are precious.